Sam Joseph once spotted a former resident playing basketball in Covenant House Michigan’s gated five-acre campus. It was Prince, who had been a homeless teen when he found shelter, education and life-skills training at Covenant House Michigan, then got a scholarship and moved on to Ferris State University. “Why are you here? Did you get kicked out of school?” asked Joseph, CHM's executive director. “No, I came home for spring break,” explained Prince. Joseph cried on his way home that evening as he recounted his conversation with Prince. Covenant House Michigan is a faith-based, privately funded organization in Detroit that serves homeless, runaway and at-risk youth up to age 22. Staff and volunteers provide shelter, educational and vocational programs for those 18 and older who come voluntarily when there is nowhere else to turn. About 55,000 young people have been helped in some way during the last 15 years. At any one time, about 100 are living at the facility as they prepare for independence. While there are many ways to gauge success, for Joseph, it gets down to this: Do the young people served at Covenant House feel loved? Joseph was working in New York City as a mental health services coordinator when he was asked to become the first executive director of the soon-to-open Covenant House in Detroit. What little Joseph knew of Detroit was negative. But the idea of working with homeless young people appealed to him. “I thought I might be able to do something good,” said Joseph. He also liked the idea that CHM is run mainly on private donations, and would not be restricted in any way by bureaucracy. Danielle Martin, 24, came to Covenant House as an 18-year-old who’d had a rough childhood and was living with a cousin who used her as a live-in baby-sitter for her own children, preventing her from continuing her education. 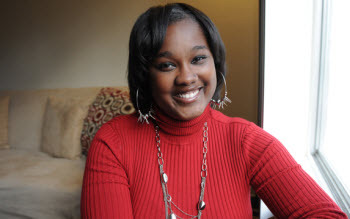 At Covenant House – which includes separate dorm-like facilities for men and women – she learned new job-hunting and life skills, immediately enrolled in Wayne County Community College, and enjoyed the security of what she realized was the first solid home of her life. Martin now lives in Westland, works at the post office, and is studying special education at Wayne State University. She said she hates to think where she’d be if she hadn’t lived at Covenant House for those eight months. “It was the best home I ever had – besides the one I made for myself afterwards,” she said. Joseph said some of those who come to CHM dropped out of school years ago. Within the first three months it was open, about 900 young people, ages 11 to 22, had been helped at CHM in one way or another. “They were hungry, they were poor, they were abused, neglected, and almost all were school dropouts,” said Joseph. CHM soon started a street outreach ministry in which every day, a small staff goes out into tough neighbors where young people are living in abandoned houses. They’ll give them clothes and toiletries, talk with them, invite them to come to CHM. The young people who find shelter at Covenant House must spend their days in school, working or looking for work, or in treatment. About 900 are enrolled in high school at one of three Covenant House Academies, including the one on the main campus. The southwest academy recently started a volunteer-based child care program so students can drop off their children in a safe educational center while they work toward their high school diploma. The men’s and women's dorms offer a total of 75 beds, with three or four to a room. But no one is turned away, as there is always room for a mattress on the floor. Sometimes the need seems overwhelming, Joseph said. Most of the 700 graduates of the three academies go on to college.